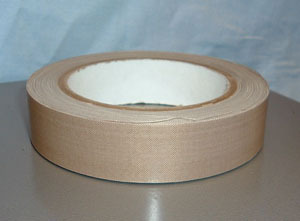 PTFE Tape – Tape Solutions, Inc. When you think about screwing two pipes together you can see that this will not provide the tightest of seals, especially when water or air tight seals are desired. This is where PTFE tape comes into play, as this type of tape fills in the spaces left behind in the threading in order to create the tightest seal possible. Although this still requires some precision as adding too much PTFE tape may cause a loose fitting seal. It all depends on your application and the environmental factors that are involved within that application. To better know if PTFE tapes are right for your job, consult with a PTFE tape manufacturer who can better explain how this product may fit into your application. Thread seal tape is great for just about every application where pressure is present and leaks can cause problems, regardless of the substance involved. Applications that deal with gases and liquids both require the tightest seal possible in order to maintain the proper levels of flow as well as containing the substance within the pipe or tube system. In order to utilize PTFE tape, the user simply needs to place the tape around the problem area or apply it to the pipes threading before screwing the two pieces of pipe together. Once everything is in place, a final run through is needed in order to make sure that there are no leaks present. If there are, it may be due to the fact that too little of PTFE tape was used or possibly some PTFE tape needs to be removed in order to turn an inadequate seal into a great seal. Whatever your application may be, if you require the tightest seal possible consult with a PTFE tape manufacturer who has years of experience and will be able to help guide you to the best possible product for your application. Having the right product and knowledge of how to best utilize that product is the difference between good and great performance. PTFE Tape PTFE tapes, also known as thread seal tapes, are commonly used within the plumbing industry as a way to enhance the seal between two pipes.